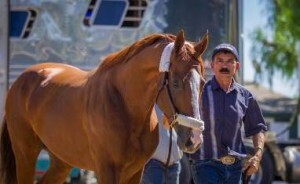 North America’s all-time leading money earner, California Chrome arrived by van at Santa Anita on Sunday at 12 noon as he begins final preparations for next Saturday’s Grade I, $300,000 Awesome Again Stakes, final major steppingstone to the $6 million Breeders’ Cup Classic at Santa Anita Nov. 5. Owned by Perry Martin and Taylor Made Farms’ California Chrome LLC, the 5-year-old California-bred horse by Lucky Pulpit has earnings of $13,252,650 and will be in search of his sixth consecutive victory on Saturday. Fresh off a smashing five length score in the Pacific Classic Aug. 20, California Chrome, a winner of the 2014 Santa Anita and Kentucky Derbies, began his current five game winning streak at The Great Race Place on Jan. 9, as he was an impressive winner of the Grade II San Pasqual Stakes. Voted Horse of the Year in 2014, “Chrome’s” biggest career victory came three starts back on March 26, as he waltzed to a 3 ¾ length victory in the $10 million Dubai World Cup. Tentative plans for the striking chestnut call for him to conclude his incredible racing career by running in the $12 million Pegasus World Cup at Gulfstream Park on Jan. 28. Following the Pegasus, California Chrome is expected to begin study duty at Taylor Made Farm in Kentucky. The Awesome Again Stakes is one of five Grade I Breeders’ Cup “Win and You’re In” Challenge races that reward the winner in each a fees-paid berth in their corresponding races on Nov. 4 & 5.